Originally ran in GeekMom on March 13. What would spring and summer be without a party? Being a geeky mixologist is sometimes just as simple as mixing two or three ingredients with the proper presentation for impressive results. This is also a good way to teach kids that those fancy drinks they see at restaurants don’t have to have alcoholic to be cool. Ever since J.K. Rowling wrote the word “butterbeer,” Potter fans have concocted their recipe ideas. After The Wizarding World of Harry Potter at Universal’s Islands of Adventure theme park introduced their own version, there have been even more copycat recipes. A quick and “lazy” version of this recipe kids can make anytime is to take one 12-ounce can or bottle of cream soda and drizzle in some butterscotch syrup (ice cream topper) to taste. Mix together and top with plain old whipped cream (hence the “lazy” version). For those with snow-cone makers, this mixture also tastes great blended in with a cup of shredded ice for a frozen butterbeer. Take a cup of cranberry juice and one-half cup of orange juice for a fiery drink, and give it a little extra heat with a teaspoon of cinnamon dolce syrup. For presentation, dip the edge of the glass in water and in a small plate of gold sugar sprinkles (before adding the drink, of course). Cut a slit at the end of a gold-wrapped chocolate coin for a garnish on the side, and your drink is ready to accompany a dragon’s hoarde. Find a favorite character’s colors and add a toothpick garnish of their symbol (stickers and paper cut-outs are fine). For example, red, white and blue for Wonder Woman or Captain America; black and yellow for Batman or Batgirl; orange, brown and yellow for Rocket Raccoon; or green and purple for Hulk or Joker. 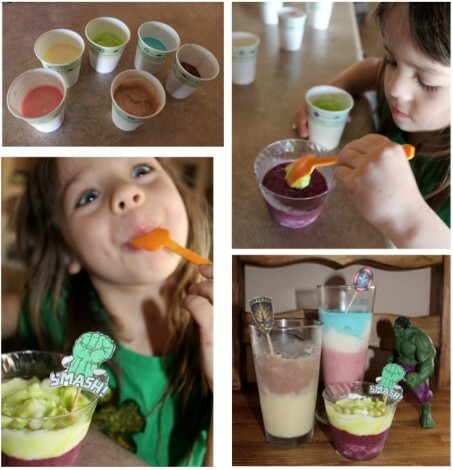 Let kids mix and match their own “hero” ideas, but be careful. It’s really easy to get carried away and over indulge on these, healthy or not. Coming up with super color combos is part of the fun. Disneyland’s New Orleans Square likely goes through a swimming pool’s worth of those non-alcoholic mint juleps. For good reason too, as they are as addicting as the strongest alcoholic drink. They do have an official recipe for these, but an easy version is to take a can of concentrated limeade, add a tablespoon of lime or lemon juice, and a tablespoon of green mint syrup. This will make the base mix. Add one part of this mix to two parts club soda per glass. Modify this ratio if too sweet, or not sweet enough. Garnish with a maraschino cherry and a mint sprig. Walt Disney World’s Tortuga Tavern had a popular nonalcoholic sangria. As a native Texan, I’ve learned the key to Sangria is fruit. Lots and lots of fruit! To get this effect, add sliced apples, oranges, grapes, and limes and soak them in a pitcher of grape juice for at least an hour. Some people like include berries like blueberries and strawberries, as well as even pineapple. In my opinion, the more the merrier. Once the fruit has soaked, add one part grape juice with one part club soda, lemon-lime soda or sparkling water. Pour into individual glasses, fruit and all. Garnish with even more fruit. I can’t stress enough the importance of the fruit. Star Wars blue milk is so easy to make, it’s a shame to not modify it for party purposes. 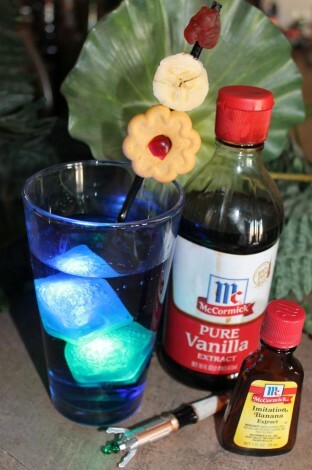 Instead of just adding a drop of blue food color to milk, mix in some vanilla ice cream for a blue milkshake and garnish with a green, blue, or red glow stick. We have some lightsaber chopsticks we like to use as well. 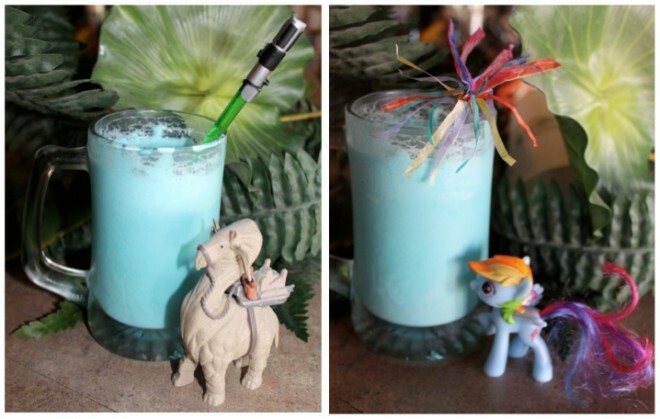 One colorful drink stick turns Star Wars into My Little Pony. Mix a can of lemon-lime soda with a drop of blue or green food coloring. Then, add a little flavor to taste celebrating one’s favorite Doctor (banana extract or vanilla for custard-lovers). The garnish is what makes these. Place a bamboo skewer through the middle of a Jammie Dodger (we’ve found these in gourmet food stores, but any shortbread jam-filled cookie will work), a slice of banana, and a “jelly baby” or gummy bear. Use a glow stick or novelty glowing ice cube (available at party supply stores) to give it that sonic glow. A simple drink gets a “sonic” effect with the right garnish. Gather the ingredients for all of these drinks over the course of the week, and work on perfecting a different drink each day. 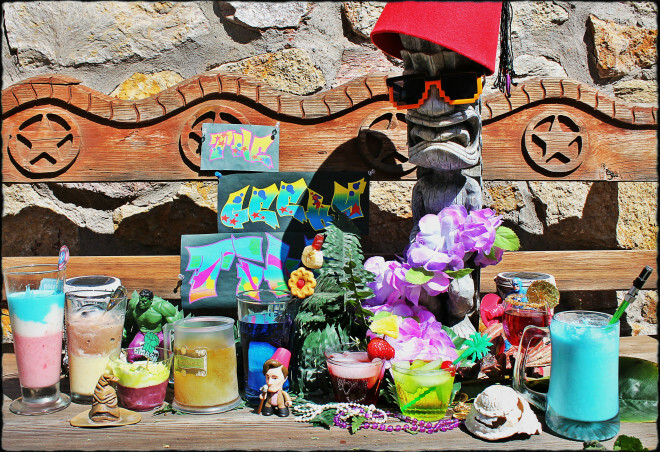 By the weekend, you should be ready for a springtime “Geeky Tiki” party, where you can serve your friends some colorful concoctions. Make it a potluck-style event where everyone can bring their own geeky snacks. 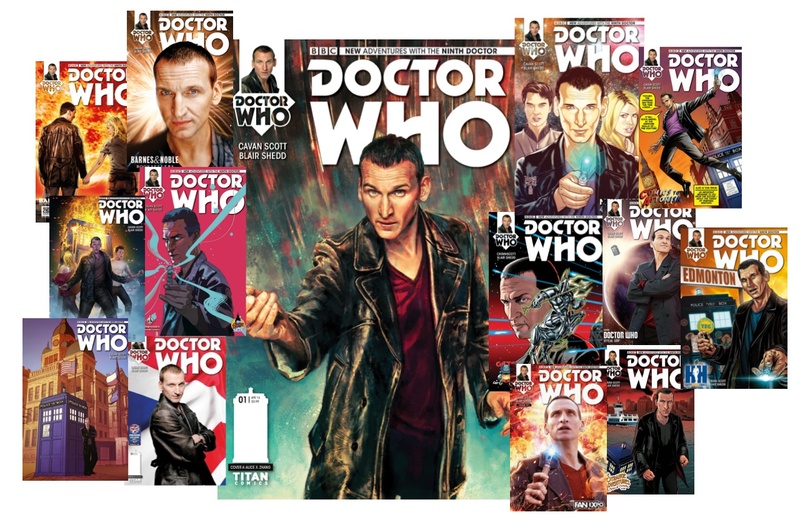 A few of the variant covers available to welcome the Ninth Doctor’s new mini-series. Originally ran in GeekMom on March 18, 2015. Ninth Doctor comics scribe Cavan Scott. Image: Titan Comics. The new series will have plenty of the humor and adventure Ninth Doctor fans love. Image: Titan Comics. Today, the show has entered the record books as the longest running science fiction in television show in history, and celebrated its 50th anniversary in 2013. Scott hopes this series helps extend his and other Doctor Who lovers’ gratitude for everyone involved in creating Series One getting the ball—or TARDIS—rolling once more. Every time we get a new pet addition to the family, we create a little portrait, mixing photos and illustrations. The best part is, this isn’t something that takes any refined drawing talent, as the portrait’s main attraction is live action. Also, the purpose of the portrait isn’t to show off how good an animator we are, but to capture the essence of our pets. These are simple to make. First, find or take a photograph that captures the pet’s defining features. Action shots of them frolicking are fine, too. 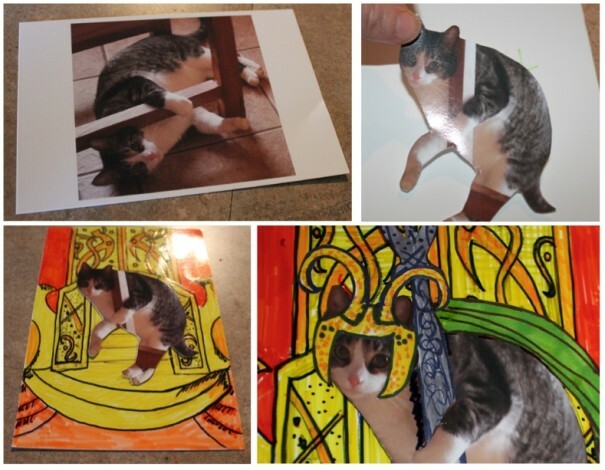 Print and cut out the photo of the pet, and place it on a piece of paper. Trace around it so the outline appears where it will go on in the final drawing. Set the picture aside until later. Draw a proper setting for this pet (outer space, medieval throne room, Wayne Manor), making sure to leave the outline visible (it’s okay to color the entire background, as long as the outline can bee seen. Any medium is fine, too. We’ve made portraits in watercolors, crayons, colored pencils, felt tip markers, and even pen and ink. Finally, glue the photograph back in place, using the outline as a guide. If it still seems incomplete, draw and cut out some “accessories” for the pet (crown, scepter, wand, dead fish). Place it in a simple, inexpensive photo frame. We’ve been creating these for all our pets, as they become part of our home, and have built a colorful little attention-getting “pet gallery” in our girls’ room. Our gallery includes our first dog, Gypsy and our aloof and stoic cat Bagheera in a Bella Notte pose with my parents’ dog, whom they visited often. We also rescued a stray dog, Tramp, who loved to jump at balloons, bubbles and sprinklers. He is in a portrait reflecting his high-flying demeanor. 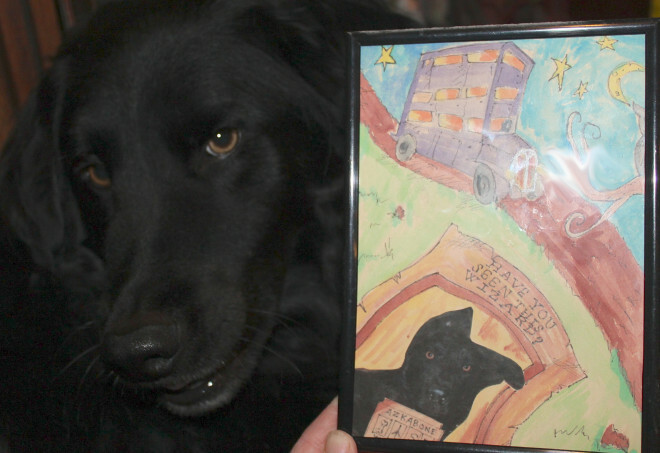 All of these pets have since passed on, but our current dog, Sirius Black, named by my Potterhead daughter, has a portrait in honor of his namesake. Our newest edition is a cat that adopted us. We literally opened the door one day and he ran inside, refusing to leave the house. It turns out his owners may have packed up and left him, neutered and declawed, to fend for himself. He immediately became the punching bag of a larger neighborhood cat-bully. As a result, he found the first sucker on the street, and bombed his way into our lives. We decided to name him Loki, and our portrait reflects the very “I own you guys, now” nature in which he came to be our pet. 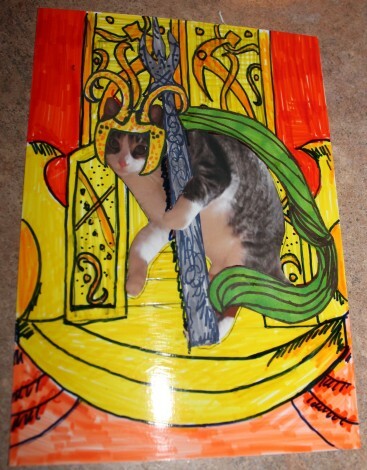 Loki, of course, is seated on the throne in Asgard, in appropriate takeover mode. We’ve also learned, sadly, when the inevitable time comes to say goodbye to a pet, one of our most effective ways of dealing with the loss is to celebrate their life and the times we had with them. These little portraits have helped us do that. I recommend these as a good way for kids to create a way to remember their pet that isn’t somber or sad. On a happier note, these are also fun, personalized, one-of-a-kind gifts to give to fellow pet lovers. We made a Song of the South inspired portrait for my parents’ dog who they rescued from a schoolyard, and a vintage Paper Moon-era sepia portrait for an older family friend, and her overly-pampered Bichon Frise. We also made a Brady Bunch-style poster for my brother’s house, which is constantly filled with both kids and pets. 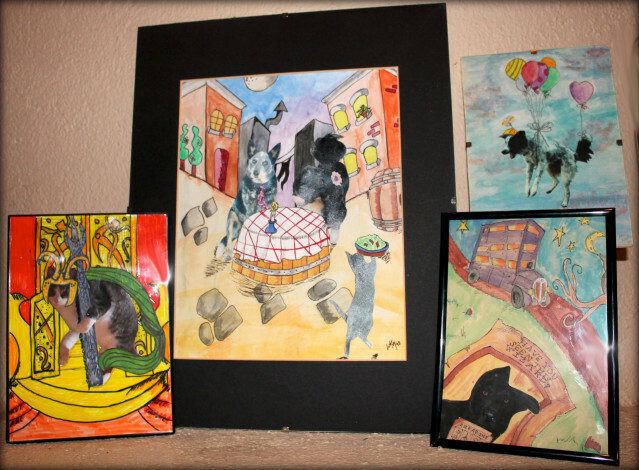 We still get comments from people who have seen these paintings, and just love the way they fit the pets’ personalities. We’ve also learned the way people approach their pet ownership, including what they name them, and how they treat them, teaches us as much about the owner as it does the pet. Everyone who owns, and loves, a pet knows their time with us is never long enough, but always filled with adventure and memories. Even when they are no longer in our homes, they are forever in our hearts. Sirius Black and his Muggle-made portrait. Post originally ran on GeekMom.com on March 5, 2015. 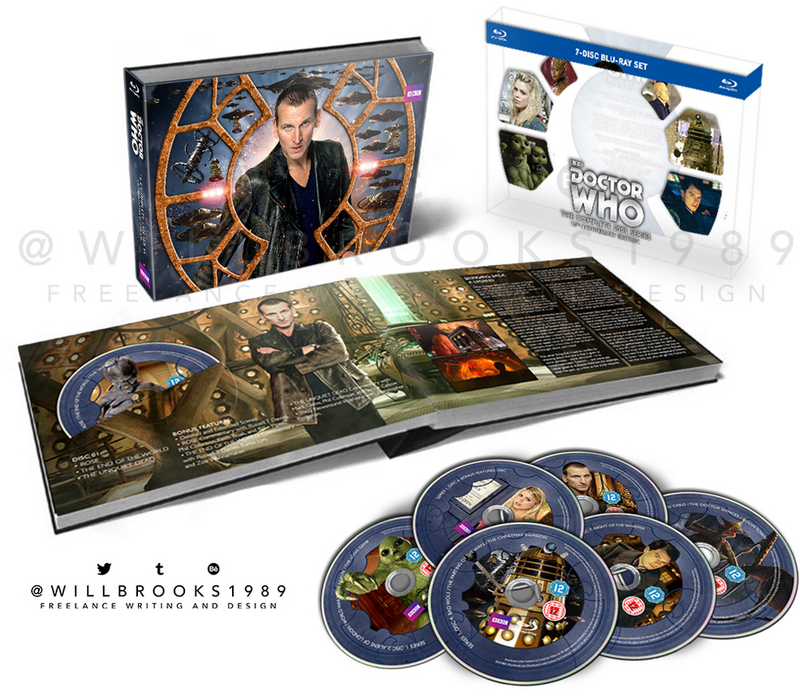 A mock-up creation by graphic artist and Will Brooks for what he’d like to see in a Tenth Anniversary Doctor Who Series One DVD set. 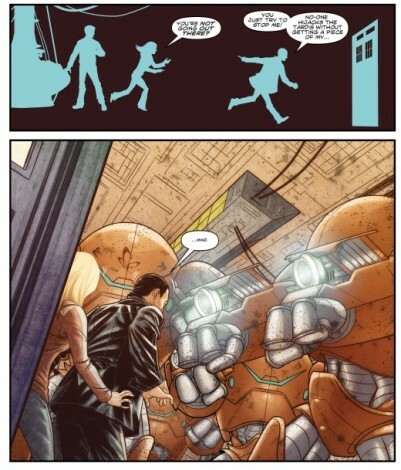 Us Ninth Doctor Fans can always dream. Image courtesy of Will Brooks. Originally ran in GeekMom.com.as part of my two-part series on the Tenth Anniversary of the Ninth Doctor on Feb. 27. 2015. Doctor Who fans have another milestone to celebrate, as 2015 marks the Tenth Anniversary of the debut of the show’s return to television after a more than 16-year series hiatus, not including the one-time made-for-television movie in 1996. Series One of the new era of The Doctor debuted March 26, 2005, featuring the streetwise leather-and-jeans-clad Ninth Doctor, portrayed by Christopher Eccleston. The show reached a new generation of soon-to-be Whovians, many of whom had never before seen the show. The series also introduced a new companion, Rose Tyler, played by Billie Piper, and Time Agent “Captain” Jack Harkness, played by John Barrowman. Harkness’s character became so popular, he gained his own edgy spin-off series, Torchwood, in 2006. Cardiff Bay-based writer and designer Will Brooks has become very familiar with nearly every episode of Doctor Who as part of his ongoing daily Who-watching project, “The 50 Year Diary,” for the UK-based blog, Doctor Who Online. A sampling of some of Brooks’s Who-related work. Images courtesy of the artist. All of Brooks’s entries for the first four Doctors (William Hartnell through Tom Baker), are available in book form via Page Turner Publishing, as well as in a Kindle version on Amazon. Having just run through Eccleston’s reign in January, Brooks provided in his series some very frank and truthful observations, criticisms, and kudos for watching every Ninth Doctor episode from Rose to The Parting of Ways for a second time. Despite the growing pains and flaws of the newly-relaunched series, however, Brooks agreed Series One’s success was key in keeping the show alive today. Chronicling his Who-watching isn’t Brooks’s only achievement. 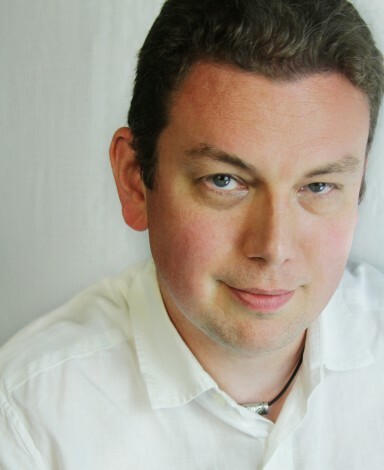 He has a long line of impressive clients from audio drama creators Big Finish Productions and BBC Worldwide, to the popular furniture design company IKEA. 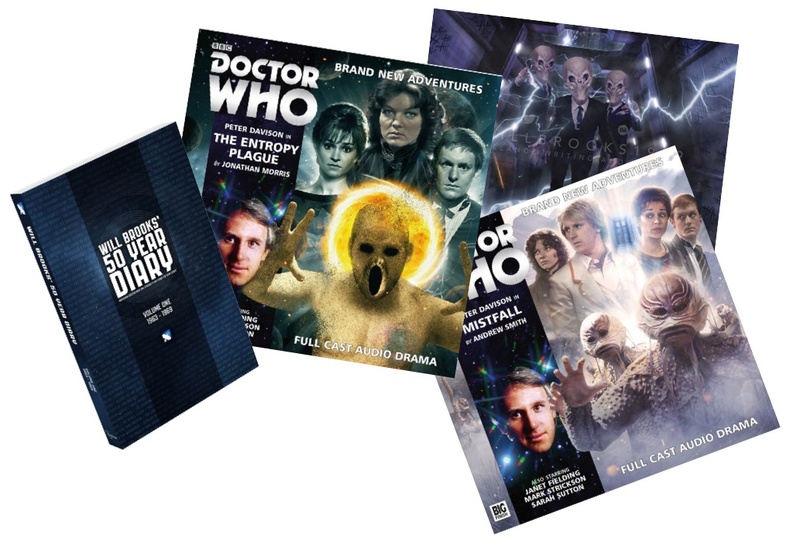 Doctor Who fans may be familiar with Brooks’s work through this year’s cover designs for a Fifth Doctor audio drama trilogy, part of Big Finish’s Main Range series. 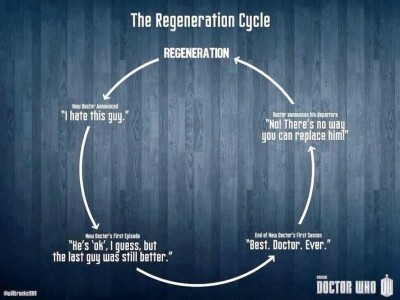 The popular flow chart summing up the Whovian response to the Regeneration, created by Brooks. Image by Will Brooks. Brooks said what people seem to most recognize of his, however, are his just-for-fun graphics he spent very little time on, thanks mostly to the rapid-paced grapevine of social media. As far as the Ninth Doctor’s incarnation lasting only one season, Brooks said in “The 50 Year Diary” that he felt one season is all this Doctor needed. He also mentioned his belief that writer and producer Russell T. Davies planned this series out so that if no other episodes were commissioned, they would “stand on their own” as a self-contained story. “Even though I think [Eccleston’s] great, these 13 episodes tell a complete story so well, that it might somehow lessen them to spend another year in the company of this incarnation,” Brooks wrote. He added that there also doesn’t need be too much unnecessary fanfare for the Ninth Doctor’s landmark anniversary. A simple commemoration, for a no-frills Doctor, and the no-nonsense actor who portrayed him, would be very appropriate. He said there have been a few retrospective features for other eras in recent years, both in Doctor Who Magazine, and on the “classic” DVDs. Brooks feels this would be a suitable way to acknowledge Series One. This type of retrospective could even be done in a way that doesn’t include any of the much-publicized theories about why Eccleston departed the show after just one, successful season, but rather concentrate on the impact of the series itself and the cast’s performances. “It’s been interesting to see people looking back on that time now that enough water has flowed under enough bridges,” he said. Brooks admits, however important it was for this first series to “get it right,” for the franchise to continue on the air successfully, he said Doctor Who fans are so loyal, they will always be around, series or no series.